Hammerfell is a barren and rocky place, the vast Alik'r desert taking up most of it, with fertile grassland only on the coasts. As such, the major population centers are on the coastline, while the majority of the country is inhabited only by shifting sands and nomadic tribes. In the north are the Dragontail Mountains, home of the misunderstood groups of Orcs reviled by many Bretons and Redguards. Hammerfell borders High Rock across the Bangkorai Pass to the north, Skyrim to the northeast and Cyrodiil across the Colovian Highlands to the southeast. Hammerfell is divided into several regions, among them the Alik'r Desert, southern Bangkorai, Craglorn, Khefrem, and Sunforge. Many isles in the Abecean Sea, including The Chain, Stros M'Kai, and sometimes Stirk, are also considered a part of Hammerfell. 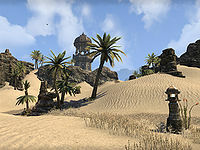 The Alik'r Desert is situated in western Hammerfell, on the shores of the Iliac Bay. The region borders Bangkorai to the east. The main city is Sentinel; others include Lainlyn, Bergama, Kozanset and Satakalaam. Among other places of note are the ruins of the Dwemer city of Volenfell, the Lost City of the Na-Totambu, and the Montalion necropolis. As the name suggests, the region is mostly a vast desert, with some fertile areas on the coast near Sentinel. The southern part of Bangkorai, also known as Fallen Wastes, is situated in northern Hammerfell. The region borders Alik'r to the west and Craglorn to the east. It also borders northern Bangkorai, which is a part of High Rock, across the famous Bangkorai Pass. The main city is Hallin's Stand (formerly named Ojwambu). The Hall of Heroes is also located here. During the mid-Second Era, at the time of the Daggerfall Covenant, Bangkorai as a whole was ruled from the High Rock city of Evermore. The Fallen Wastes, like Alik'r to the west, is a desert region except there is much rougher and rocky terrain. Craglorn is a region in northeastern Hammerfell. It borders Bangkorai to the west, Skyrim holds of Falkreath and the Reach to the northeast, and Cyrodiil across the Colovian Highlands to the southeast. The main cities are Dragonstar and Elinhir. The region was a last bastion of the Nedes and the remnants of their civilization can be found there. 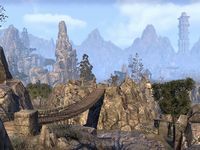 The southern part of the region, called Lower Craglorn, consists mainly of windswept, dry plains, whereas Upper Craglorn is mountainous and very similar to the Reach, which is just across the mountains to the north. Khefrem is a southern, coastal region of Hammerfell. It includes the peninsula of Hew's Bane, once known as Khefrem's Boot. In the days of the Ra Gada, Prince Habalajad, also known as "Prince Hew", endeavored to bring civilization to the barren peninsula, but all of his efforts met with misfortune. 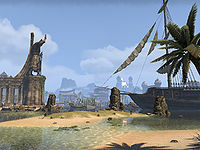 A sizeable port city called Abah's Landing was eventually established in the eastern corner of Hew's Bane. Stros M'Kai is a tropical island in the Abecean Sea, off the southern coast of Hammerfell. The main city is also known as Stros M'Kai, although it was formerly known as Port Hunding. The island often served as a haven for pirates and other criminals. It is also famous for its Dwemer ruins, which mark the western reaches of the Rourken kingdom. Sunforge is a landlocked region in central Hammerfell. It contains the city of Ska'vyn. The Chain is a little known archipelago in the Abecean Sea that is made up of at least three islands. 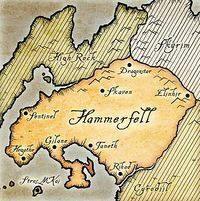 Hammerfell was originally called Hegathe by the Aldmer and the Deathland by the early Nedic people, both terms roughly meaning the same thing. In 1E 420, the Dwemer Rourken Clan settled the region after opposing the creation of the joint Dwemer-Chimer state of Resdayn. It is said that the leader of the clan threw his mighty hammer, Volendrung, across the continent, and followed it west to their new home. The region eventually became known as Volenfell, or "City of the Hammer", after the Dwemer capital built near the location of modern-day Gilane. The Dwemer of Volenfell vanished in 1E 700 along with the rest of the Dwemer race, and their empty cities were looted by Akaviri and Nordic pirates before being reclaimed by nature. Over a century passed before civilization would return to Volenfell. Fleeing the sinking of their homeland Yokuda around 1E 792, the Yokudans sailed eastward in a fleet called the Ra Gada. The majority of the refugees landed at the isle of Herne, while the remainder sailed on to Tamriel, a vanguard of invading warriors who would pave the way for the rest of their people. The Ra Gada warriors, who came to be called the Redguards, began their conquest in 1E 808 and won the entire area of what would become Hammerfell in only a few major battles against native Orc and Breton populations. The Yokudan government, the Na-Totambu, was transplanted whole, and within the next century Volenfell became known as Hammerfell, a rough translation of the Dwemeris term. Assimilation into the rest of Tamriel began relatively quickly, as the Yokudans, while displacing the Nedic men, adopted many of their customs and traditions. 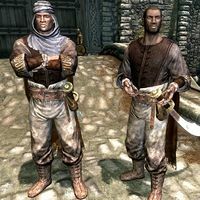 Over time, Redguard society divided into two groups, depending on their allegiance to the old Yokudan ways or the new ways of Tamriel. When Hammerfell was conquered by the Second Empire, these groups became formal "parties" that aided Cyrodiil's administration of the province. The Crowns, followers of the traditions of the Na-Totambu, retained their rights of noble council under Imperial rule. The Forebears, descended from the first Ra Gada settlers of Tamriel, were finally granted rights of ownership within their tribal districts. This "republic", however, lasted only so long as the Empire was strong enough to support it. During the Interregnum, the Crowns quickly reestablished a hereditary monarchy and reasserted their dominance over the Forebears. Adding insult to injury, the new High King of Hammerfell moved his throne from Old Hegathe to the more prosperous Forebear city of Sentinel, capital of the province to this day. In the middle of the Second Era, King Fahara'jad of Sentinel allied himself with High King Emeric of Wayrest and the Orc king Kurog gro-Orsinium and became one of the leaders of the Greater Daggerfall Covenant. The Covenant participated in the Alliance War circa 2E 582. After the death of the last High King of Hammerfell, Thassad II, in 2E 862, the Forebears took Sentinel by force in a bid to end the Crowns' oppression. Thassad's son Prince A'tor moved to recapture the city, resulting in the bloodiest massacre in Hammerfell's history. The Forebears sought aid from Tiber Septim and the Third Empire, and together they defeated A'tor's forces at the Battle of Hunding Bay. 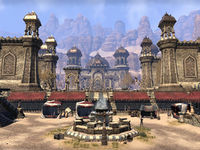 Septim took the opportunity to install Imperial governors in Hammerfell's major cities in a bid to draw the region into his burgeoning Empire, part of his ongoing conquest of Tamriel. The ruthless tactics of the governors resulted in rebellions in Stros M'Kai and Sentinel, however, forcing Septim to agree to a treaty with the Crown and Forebear factions in order to keep Hammerfell an Imperial province. Centuries later, the Thalmor of the Aldmeri Dominion would attempt to seize control of Hammerfell from the Third Empire. Emperor Titus Mede II's refusal to concede to Thalmor demands triggered the Great War in 4E 171. Aldmeri forces crossed western Cyrodiil and invaded Hammerfell's southern coast, easily sweeping through the scattered resistance put up by the disunited Redguards. 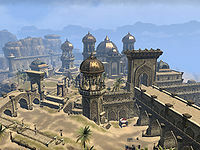 Initially only seeking to conquer Hammerfell, the Dominion launched a full-scale invasion of Cyrodiil when it realized the Empire was weaker than previously believed. Imperial fortunes took a turn for the better in Hammerfell two years later, when a Forebear army from Sentinel broke the siege of the Crown city of Hegathe, leading to the reconciliation of the two factions. After the Empire's hard-won victory in the Battle of the Red Ring in 4E 175, the Empire and Dominion signed the White-Gold Concordat and ended the war. Outraged that the terms of the treaty called for a large portion of southern Hammerfell to be turned over to the Dominion, however, the Redguards soundly rejected it. Titus II was forced to officially renounce Hammerfell as an Imperial province to preserve the peace, and fighting between the Aldmeri and Redguards continued. In 4E 180, the exhausted Dominion agreed to the Second Treaty of Stros M'Kai and finally withdrew from the region, leaving Hammerfell an independent albeit devastated nation. Redguards are divided between the cosmopolitan, progressive Forebears and the fundamentalist, isolationist Crowns. The Forebears are the descendants of the Yokudan military class, the Ra Gada, and are generally open to outside cultures such as the Imperials and Bretons; the Crowns are the descendants of the Yokudan noble class and still prefer to shun outsiders, vying to preserve the customs and culture of their ancestors. The buildings of the Redguards are notable for being heavily ornamented, with engravings and golden domes. However, some of the cities in Hammerfell are built in different styles: for example, Dragonstar consists of Nordic buildings, whereas the Colovian style can be seen in Elinhir. Since Hammerfell was home to many civilizations in the past, many different types of ruins can be found throughout the province, among them Ayleid, Dwemer and Yokudan ruins. In Craglorn, there are also Nedic and Nordic ruins. In the Alik'r, southern Bangkorai and Stros M'Kai, typical desert vegetation like palm trees and cacti can be found. 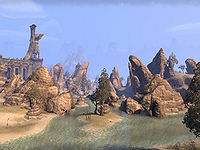 In Craglorn, crooked trees grow on the central dry plains, whereas the eastern lands near Elinhir and northern mountains are more temperate. The hot and dry lands of Hammerfell are home to many fierce creatures. 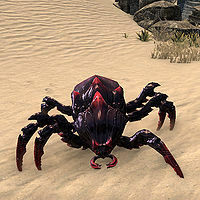 The Alik'r Desert is inhabited by dunerippers, assassin beetles, giant scorpions, crocodiles, jackals and harpies. Giant wasps, lamias and lions can be found in Bangkorai. In somewhat cooler Craglorn, one can find welwa, duneracers, or more peaceful camels, daggerbacks, fellrunners, sandroaches, and fennec foxes. A large port city on the Hew's Bane peninsula in Khefrem. A city-state in northwestern Craglorn, just south of the border with High Rock and Skyrim. A town in eastern Craglorn, close to the border with both Skyrim and Cyrodiil. A town in southern Hammerfell lying west of Taneth and southeast of Sentinel. A town in southern Bangkorai. A port city in southwestern Hammerfell that served as the capital until the Interregnum. A port city on the coast of the Abecean Sea, on the main road between Anvil and Taneth. A major port city in the Alik'r Desert, overlooking the Iliac Bay, and capital of Hammerfell. A town in north-central Hammerfell. A tropical island off the southern coast of Hammerfell near the Cape of the Blue Divide. A town in southern Hammerfell on the Abecean Sea lying northwest of Rihad and east of Gilane. This page was last modified on 31 March 2019, at 15:39.